A village pre-school in East Sussex is hoping to use a generous donation from Sussex Police to allow children to spend even more time playing outdoors. The £200 donation from Sussex Police’s Police Property Act Fund has been earmarked by Blackboys Pre-School near Uckfield to improve access to its recently refurbished outdoor area. It is intended the new access will facilitate free flow play, allowing children to decide for themselves how and where they want to play. PC Peter Cook, the Neighbourhood Schools Officer at Wealden Neighbourhood Policing Team, presented the cheque to Blackboys Pre-School manager Jenny Novkovic together with Pre-School committee chairman Daryl Willcox and committee member Peter Ullman, both parents of children attending the Pre-School. The Police Property Act Fund is made up of monies received by the police from the sale of found property and from property confiscated by order of court and then sold. The main aim of the fund is to support local projects undertaken by voluntary/charitable organisations that solely benefit the communities of Sussex. 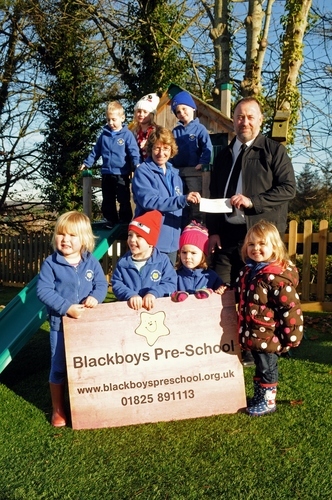 Established almost 30 years ago, Blackboys Pre School www.blackboyspreschool.org.uk is open Monday to Friday during school term times from 8.45am to 3.30pm and provides a wonderful, nurturing environment for children aged between 2 and 5 in a fabulous rural setting. The pre-school applies Montessori principles and practice to its activities as well as offering Forest School activities. To book your child in for a no-obligation free trial or to arrange a visit, call Jenny on 01825 891113 or email enquiries@blackboyspreschool.org.uk.